Spotlight on: Joe – Volunteering with Circus Skills! We’ve been housing wonderful guardians in a former commercial property in Burngreave, Sheffield since September last year. One of them, Joe, was already volunteering nearby. He volunteers for an organisation called Greentop Circus. 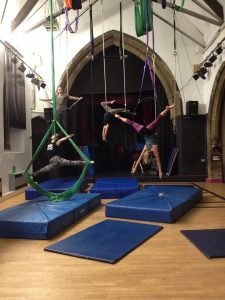 Greentop teach circus skills to anyone who wants to learn and aims to strengthen communities and circus artists in the area. In the last few months Joe and Greentop were preparing for a youth show. Read on for more! “With the youth circus we are preparing for a show. That is 4 separate classes of kids, 10-15 children per class, of a range of ages and abilities, with whom we have to guide in actions, music, costume and synchronisation. I guess at the moment my biggest memory is last Saturday. I entertained one child on my lunch break when her parent forgot to pick her up. We did some acro-balance, which is easy when your flyer is a light acrobatic child. For the show we had to re-arrange the centre from a practice space into a performance space, with appropriate seating, and lighting. The kids arrived an hour early, so they had a little time to get into costume, get their faces painted, warm up and practice. 7 minutes before the show I was volun-told I was going to be the compere for the show. (I took the bullet voluntarily because Trudi, Jade and Jess didn’t want to do it, but I did only have 7 minutes warning). I am told I was magnificent, but they would say that wouldn’t they. The Sunday after the show, we had a more fun based session, using different equipment (such as hoop and rope) that we had not been using, because we had been wanting to focus and hone one set of skills for the show. 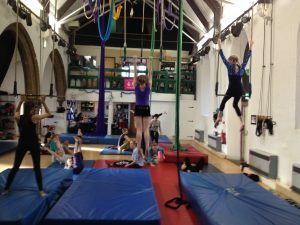 A number of the children (and instructors) were in London at the National Centre for Circus Arts, partaking in a national gathering of performing children. So, thanks to Joe for his insight into the world of circus skills volunteering! 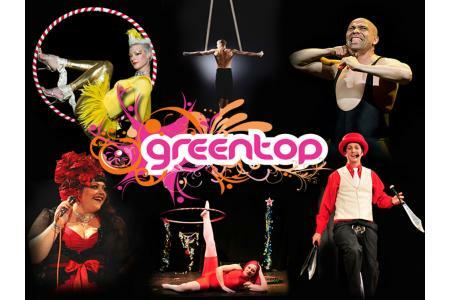 If you live in Sheffield and are interested in volunteering/participating at Greentop Circus, you can visit their website for more information. If you’d be interested in living in our property in Sheffield in the future, please apply now. We respect our guardians, selecting only the very best while supporting them to further the interests of their neighbourhood and to provide a high level of service to the property’s owner. This is a win-win-win for property guardians, owners and communities. What is a property guardian? What is different about Dot Dot Dot? I feel strongly connected with my guardian neighbours. I am getting to know other parts of the community too, through my volunteering. Dot Dot Dot is an award-winning social enterprise and a different kind of property guardian company. We house property guardians, who do great volunteering, in properties that would otherwise be empty, which benefits residents, property owners and the wider community. Tick here to confirm you accept the way Dot Dot Dot intends to store and use your data. More information in this pop-up. You can change your mind at any time by clicking the unsubscribe link in the footer of any email you receive from us, or by contacting us at hello@dotdotdotproperty.com. We will treat your information with respect. For more information about our privacy practices please visit our website. By checking the box, you agree that we may process your information in accordance with these terms.